ARE YOU TRASHING YOUR BRAND WITH POLITICAL CORRECTNESS? — AM I NEXT? ARE YOU TRASHING YOUR BRAND WITH POLITICAL CORRECTNESS? There is little or no doubt that any employee or executive risks damaging their reputation and alienating a significant portion of its customers by supporting controversial political causes. Mostly on behalf of virtue-signaling and self-serving senior management. The resultant damage to the brand can be transient or long-lived depending on the degree of emotion invoked by the company's actions. "As president and CEO of a values-driven company that’s known the world over as a pioneer of the American West and one of the great symbols of American freedom, I take the responsibility of speaking up on the important issues of our day very seriously. We can’t take on every issue. But as business leaders with power in the public and political arenas, we simply cannot stand by silently when it comes to the issues that threaten the very fabric of the communities where we live and work. While taking a stand can be unpopular with some, doing nothing is no longer an option." "That’s why Levi Strauss & Co. is stepping up our support for gun violence prevention. You may wonder why a company that doesn’t manufacture or sell guns is wading into this issue, but for us, it’s simple. Americans shouldn’t have to live in fear of gun violence. It’s an issue that affects all of us—all generations and all walks of life." "Our country has faced seemingly intractable issues like this before, but together we’ve overcome them. We can do it again. Together we can put an end to the gun violence epidemic in America." (1) Criminals, crazies, and terrorists do not respect nor obey the law. Therefore, more stringent gun control legislation does not reduce crime but creates a larger victim pool as law-abiding citizens are deprived of the means to defend themselves against people who want to harm them. (2) Areas with some of the most stringent gun control laws in the nation, also have outrageous rates of gun-related violence. Mostly in the inner cities where minority gangs appear to be in a constant state of war against each other. (3) The vast majority of gun owners engage in some form of recreational activities involving the purchase and use of the company's clothing. Thus, the company may alienate a significant portion of its customer base. (4) The shareholders have no say in the actions the can significantly reduce revenues and in some cases damage the brand with a significant portion of the buying population. Nike has engaged a controversial football player, Colin Kaepernick to represent its iconic brand. Kaepernick is the NFL player who "took a knee" during the playing of the National Anthem as a sign of protest against racial inequality. A display that is seen by many Americans as a sign of unpatriotic disrespect for the country that has provided Kaepernick with an income and lifestyle of the so-called one-percent. 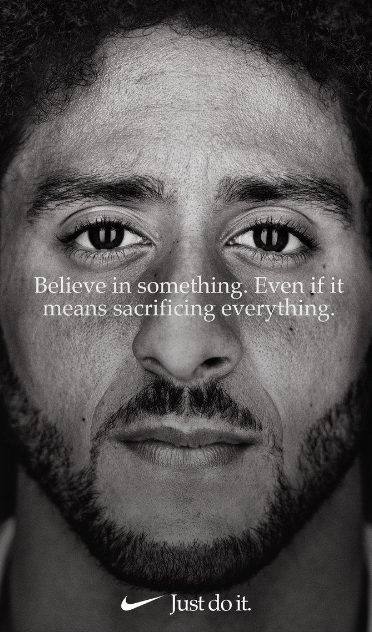 "Nike just lost about $3.75 billion in market cap after announcing free agent NFL quarterback Colin Kaepernick as the new face of its “Just Do It” ad campaign. It’s the 30th anniversary of the iconic TV and print spots." For a company that is all about sports performance, it appears curious that it will support a marginal player who remains politically controversial. Personally and professionally it seems prudent to support local causes wherever and whenever possible. If one must support a national cause, it is helpful to support a non-controversial veterans, health, or disaster relief group.